Sometimes people respond with disbelief when you mention delicious vegan food. This seems even more so when it comes to cakes. I know people who think that “delicious vegan cake” is an oxymoron. More fool them. I was at my sister’s birthday party recently. At family gatherings we all bring part of the meal and there are always plenty of vegan options, except for the cake. So this time I offered to bring the birthday cake, as usually I don’t get to eat any. 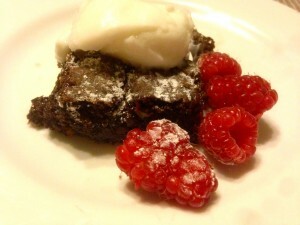 I made brownies that were slightly adapted from the recipe at Oh She Glows. I used more walnuts and chocolate chips and slightly more raising agent. One reason I think they were so delicious because I didn’t stint on the quality of the chocolate. I used 70% couverture chocolate and some top-notch cocoa, both from Monsieur Truffe in East Brunswick. They were not overly sweet, with a fantastic, slightly bitter, dark chocolate flavour. Line a 20 cm square tin with baking paper and lightly grease. In a large bowl, mix together the dry ingredients (flour, almond meal, cocoa, salt, bicarb). Melt ½ cup of the chocolate and the butter in a microwave or over a saucepan of hot water. Add in flax mixture, sugar, vanilla, and almond milk and mix well. Pour the wet mixture over dry mixture and stir to combine. Now fold in the walnuts and remaining ½ cup chocolate chips and stir. It is a fairly stiff mix. Scoop the mix into the cake tin and smooth down flat. Allow brownies to cool in pan for about 1.5 hours. Be patient! Remove carefully from pan onto a cooling rack. Perfect timing. I need a delicious dessert to take to a friend’s place for dinner tomorrow night. Will be giving this a crack tonight! They really are good. I used some Alpine coconut yoghurt on the top with the raspberries.